Not too long ago the European energy consulting firm Ecofys issued an update of its report commissioned by the UK’s Department of Environment, Food and Rural Affairs (DEFRA) entitled Factors Underpinning Future Action. 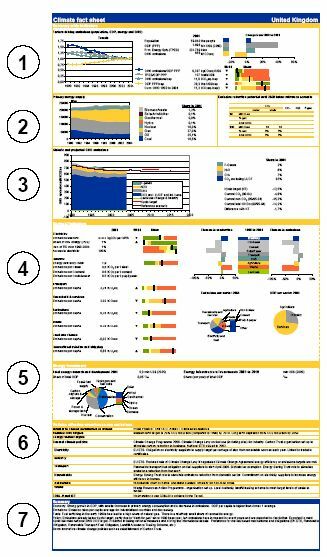 “Fact sheets” with relevant emission, energy and policy data in at-a-glance format for 60 countries — the largest Annex I countries, all European Union member states, the largest developing nations (such as China and India), plus a few other countries that have been or are expected to be active in the upcoming negotiations. It’s an intense but interesting read. It frankly made my head ache with the buzzing of new insights to the complexities of forming a meaningful international pact for the post-2012 regime that everyone can sign onto (and actually ratify — yes, I’m looking at you, Australia and US, when I say that). If you are a climate change policy junkie and haven’t already read the report, I would recommend downloading the whole thing (you have to register one-time with your name and email, but it’s free) and perusing it. I’m adding it to the Climate Change section of the Temas Recommended Reading List. For me the most interesting portions of the report were the fact sheets provided for Argentina, Brazil, Colombia, Mexico and Venezuela, plus the portions of the main text discussing how Brazil and Mexico fit into the various scenarios. I’ve taken the liberty of extracting the fact sheets for the five LAC nations and providing them as separate PDFs downloadable by clicking on the link for each of their names in the prior sentence. They are chock full of data, so much so that it takes a reader’s guide (click on image at right to see enlarged version) to fully grasp all that you’re looking at. section 1: population, GDP on a purchasing power parity (PPP) basis, GDP per capita, GHG emissons per GDP unit (“carbon intensity”), total primary energy supply (TPES) per GDP unit (“energy intensity”), GHG emissions per capita, cumulative GHG emissions 1900-2004 divided by 2004 population. section 2: energy consumption by source type (trends and status as of 2004), emissions reduction potential until 2020 below reference scenario. Sectoral indicators (section 4) for electricity, industry, transport, household and services, agriculture, waste, land use change, international aviation and shipping, including emissions and GDP share in 2004. Policies and measures affecting GHG emissions (section 6), including relevant agreements nation has signed onto, participation in Joint Implementation (JI) or clean development mechanism (CDM) projects, etc. You might be wondering why 2004 is used so much. Evidently that is the last year for which full data in all categories is available for the countries — important in that a main goal of this report is comparability. 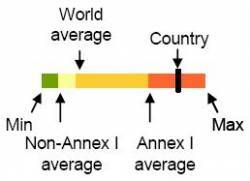 For several of the indicators, a “performance meter” is provided (see example at right), showing where the particular country falls on a sliding scale marking the world average, Annex I average and non-Annex I average. 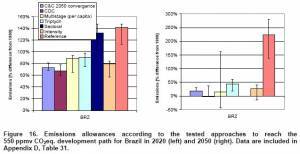 The Ecofys report includes more detailed discussion of how key countries would fare under the various post-2012 regime scenarios, among them Brazil and Mexico. 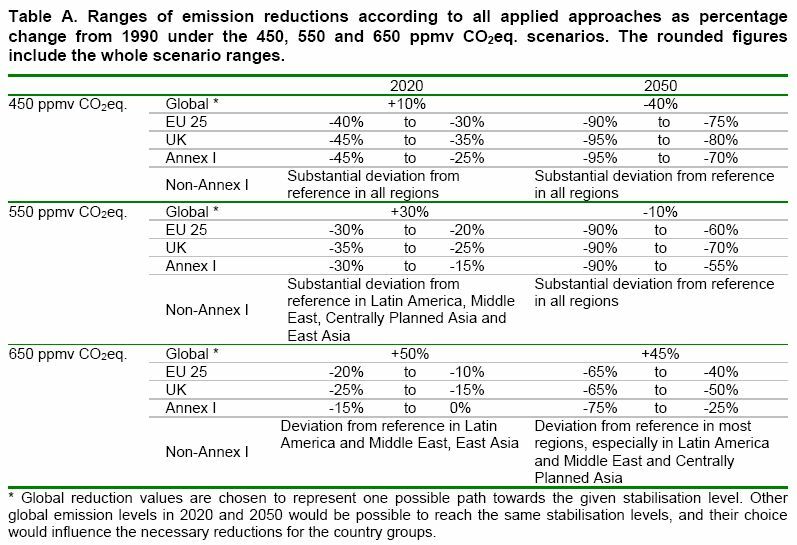 For the former, assuming that the post-2012 global regime aims for a 550 parts per million by volume carbon dioxide equivalent (ppmvCO2e) stabilization target by 2050, under all scenarios Brazil would have to slow the growth of its GHG emissions by 2020 and reduce them thereafter until they are 25% below 1990 levels by 2050. 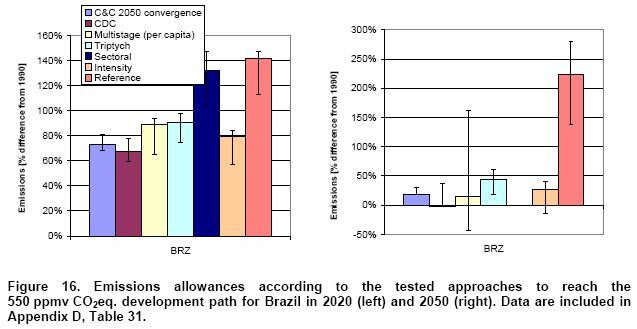 That said, the report concludes that the Triptych framework would be most favorable for Brazil (click on chart to enlarge), given its relatively low GHG emissions from electricity generation and transport. 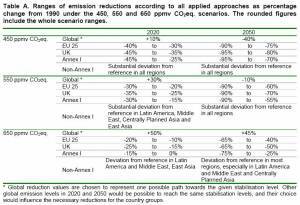 The Triptych approach allocates emission allowances among countries based on several national indicators that take into account main differences in national circumstances relevant to emissions and emission reduction potentials. A national target is set based on allowance calculations for various sectors; the national total target would be binding, but the sectoral targets would not, allowing governments some flexibility in how they meet the national total target. The report suggests that Brazil focus on slowing emissions in deforestation, agriculture and industry, and that it aggressively pursue carbon finance. 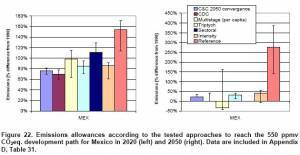 Like Brazil, Mexico under a 550 ppmvCO2e by 2050 global regime would have to slow the growth of its GHG emissions by 2020 and reduce them thereafter until they are 25% below 1990 levels by 2050. Mexico has relatively high emissions from the electricity and transport sectors and land-use changes, but the data suggests that Mexico has more capability to act than most developing nations. None of the protected global frameworks clearly favor Mexico (click on graph at right to enlarge). C&C and CDC would require early reductions. Triptych would require tough cuts in emissions in the electricity sector. Multistage would allow Mexico more short-term room to grow, but substantial cuts later on.